If you pose the question "what kind of car should I get" to anyone here on Jalopnik, the answer will invariably be "Miata," no matter what you need to do. Towing something? Miata. Date? Miata. First car? Miata. Moving to Alaska? Miata. Since 1989, the Mazda Miata has been THE affordable sports car for the car guy that doesn't want to spend his entire day cleaning up an oil leak from a British convertible. It's lightweight, it's fun, it's the essence of motoring. But is it the perfect car? Yes. And no. When I was searching for a first car, I didn't want a Miata, at all. I actually hated the idea since, y'know, it's a girly car. 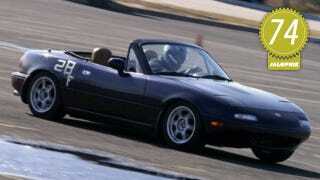 But my Dad kept telling me I was wrong and that the Miata would be the perfect car for me. I used to race go karts, it's practically a go kart. I eventually came around. The example I ended up buying was a 1996 model off of eBay from a seller in Miami, Florida. This car is the desirable M-Edition, which means it came with Enkei wheels, a limited slip differential, saddle leather interior, an alarm system (which makes tons of sense on a car without a roof), Nardi wood shifter and handbrake, and a special paint called Starlight Blue Mica, which earned me a lot of ridicule in high school because it is kinda purple. My car had just 9,000 miles when I bought it seven years ago, and now has 67,000, which still makes it a low mileage example. It's also far from stock, which is what it was when I bought it. Kosei wheels, Bridgestone RE11 tires, a Hard Dog roll bar, Koni shocks, Flyin' Miata springs, chassis braces, sways, DBA rotors, Porterfield pads, and a Racing Beat exhaust are among the mods I've made to the car. Fair warning: Since this is my car, this will be an incredibly biased review. How can you not like a car that looks like it's smiling at you? And how can you not like a car that has pop up headlamps? I don't think it's possible to truly hate the Miata. It looks so damn friendly. The sleek and rounded body isn't complicated, which is something that I really like about it. There is no stupid body cladding or unneeded spoilers to interrupt the flow. It's very simple and not busy at all. It has classic proportions, but I think it sits too high when stock. It looks a bit like a small roadster truck. This one sits around two inches lower than stock, which I think improves it a lot. The lower ride height is at the expense of usability — I now have three inches of ground clearance which can make speed bumps tough — but it looks good. The M-Edition adds a few little bits that don't come stock on the regular Miata, like leather seats, wood hand brake, and a Nardi shift knob, which I replaced with aluminum pieces from Voodoo. It's well built and simple, which is what I like. But that doesn't exactly make it the greatest thing this side of a Porsche. The seats are blah. They have no side bolstering and don't really hold you in through aggressive cornering. The vents for the HVAC shift around if you hit a slight bump. The wheel, like anything from the 1990s, has a huge hub because of the early generation airbags in there. Did I mention it's cramped? I'm just over six feet, and I have the seat all the way back so I can fit in the car. After two hours, I develop such a cramp in my right hip that it's nearly unbearable. The 1996 cars have the 1.8 liter 'big block' engine that puts out an astonishing 133 horsepower. All that power propels the Miata to 60 in a rocket quick 8ish seconds. Now, that's not fast, but I've honestly never felt that the car is slow. You notice it when you drive something really fast, like a ZL1, but those cars are too fast. There has never been a situation where I felt the car was too slow for the road or I couldn't beat someone off the line. Except that one time I found out a Jeep Liberty was just as quick as my car. That was depressing and made me concede that the Miata is great at a lot of things, but acceleration isn't one of them. If you do manage to get the Miata up to a speed where you need brakes, it won't let you down. Most of my ownership has been spent on stock rotors with Carbotech pads (I just switched the brake setup last week). When I judge brakes in other cars, this is what I compare them to. Pedal feel is excellent and bite is progressive. It's an aggressive setup, so if you really stomp on it, your eyes will burst out of your head. Repeated hard braking results in near zero fade and grins. You know how cars these days have active damper settings? In comfort mode, they're pliable, but in the most aggressive setting it's like the suspension has been replaced with a wooden board? Well, my car is like driving a piece of steel. It was my choice since I wanted to autocross, and it's perfect and awful at the same time. I wanted it stiff to be a weapon in the corners, and it really is. But the problem is that not every road is perfectly paved and smooth. On rutted New Jersey roads that have to deal with multiple seasons, plows, and large trucks, this car can be an absolute nightmare. It's like being in the dryer on the "kick Travis in the groin" cycle. But once you come to a pristine smooth road, it's all worth it. Here's where the Miata comes into its own. My car is setup on the looser side, so it has a ton of front end bite and a free rear that likes to rotate. It's just how I want it. You can really attack corner entry and then let it float around with you to the other side, which makes it a ton of fun. But that's only when you're really on the edge. In normal driving, it is rock solid and glued up to very high speeds. You can easily go three times the recommended speed into certain corners and make it out the other side with no worries, not that I've done it before. Since I've changed the suspension, I've never gotten the car into a scary situation. Another standard by which others should be judged. There is no linkage to the gearbox, and that's because you're sitting right on top of it. Throws are short and direct, with a nice little notch into each gear. Missing a shift is nigh on impossible since the gates are very well defined. The clutch is light with an engagement point near the top of its travel. It's my favorite manual gearbox. Stock, it doesn't sound all that evocative. The claim is that it was tuned to sound like a Lotus Elan, but I don't buy that for a second. My car has a Racing Beat exhaust. Other than having an obnoxiously large tip that I could fit my head into, it also makes a great noise. I went for a midpipe silencer so it isn't annoyingly loud and doesn't drone on at high speed. I made the right choice. With the top down and in a tunnel, I think it sounds really great. If only I could say the same for the radio. Even though there are speakers in the headrest, the CD/Casette unit is weak. Music just sounds eh. Uhhhh. The Miata doesn't have much, unless I start counting blinkers and wheels. It has mechanical cruise control that actually moves the pedal when it needs to accelerate. It's like a ghost is driving the car. In addition to that, it has headrest speakers and a stereo that will raise the volume depending on road noise. I'm also giving it a point for having pop up headlights because pop up headlights are awesome. In terms of value, a Miata is peerless. It has no peer. None peers. No matter what your budget is, there is a Miata you can buy. And the best part is that when properly maintained, they will run forever. The engine is an industrial strength workhorse. If something does go wrong, you can get replacement parts for basically no money. On top of that, the aftermarket has tons to offer for the Miata at reasonable prices. Advice comes free too, and the community is full of friendly, helpful guys. If you're looking for a comfortable car, Miata might not be the answer. Same goes for wanting a ton of superfluous features that you don't really need. But if you want the definition of a car, you don't just need to get a Miata, frankly, you are stupid not to. Driving one can be a religious experience. And if you don't modify yours like mine, perhaps you won't ruin it.